The sampler is 19 inches long.. I thoroughly enjoyed working on this sampler. 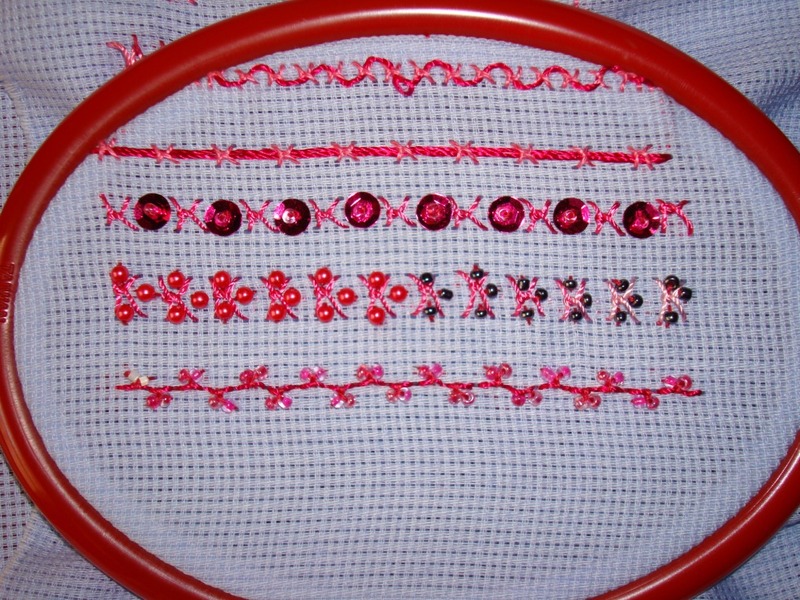 This is last set of variations of siennese stitch from stitch challenge-TAST2010 by Sharon.B. 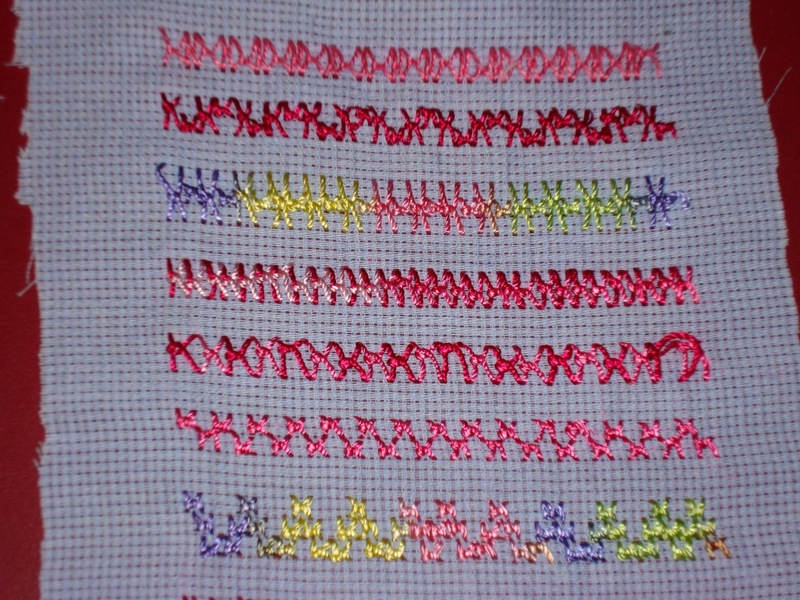 10a-A row of siennese stitches with as straight stitch on top and some fly stitches done at the bottom. 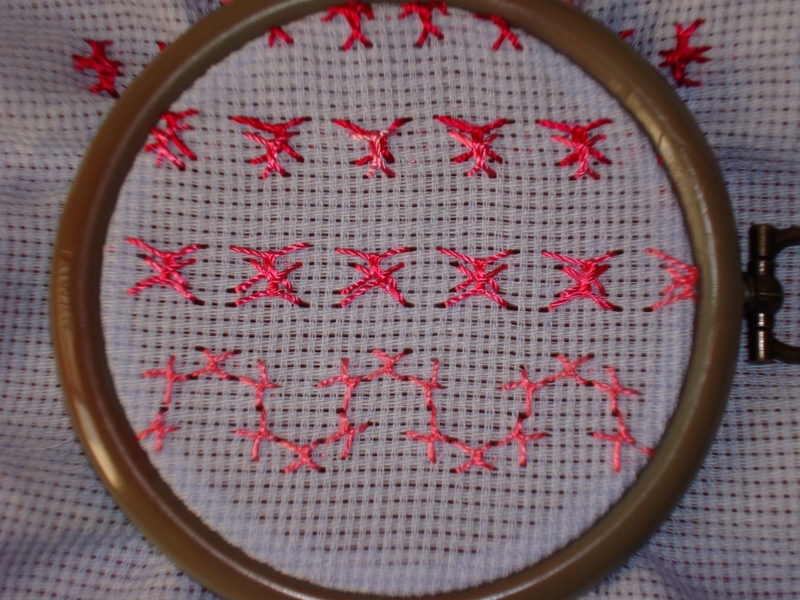 10b-A row of stitches are laced with perle cotton. 10c-the stitch is used for couching down perle cotton thread. 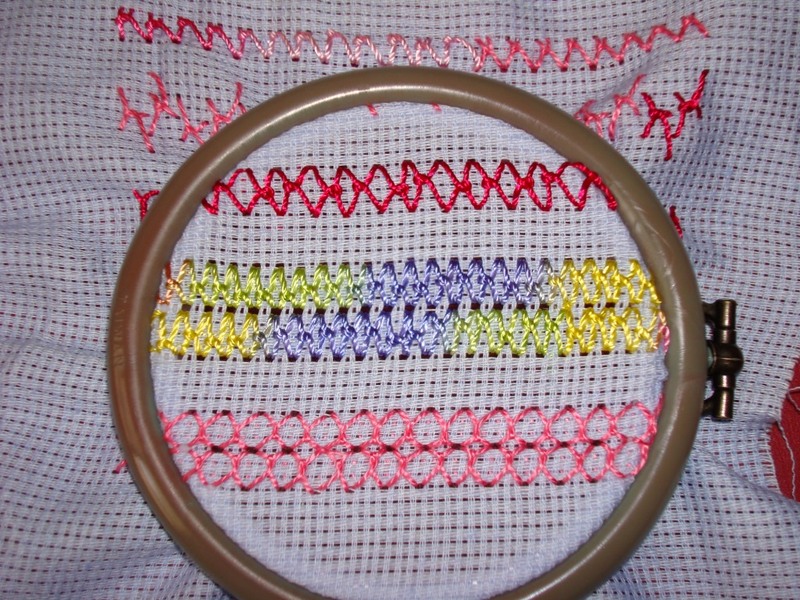 .11b-Added 3 beads to each siennese stitch. 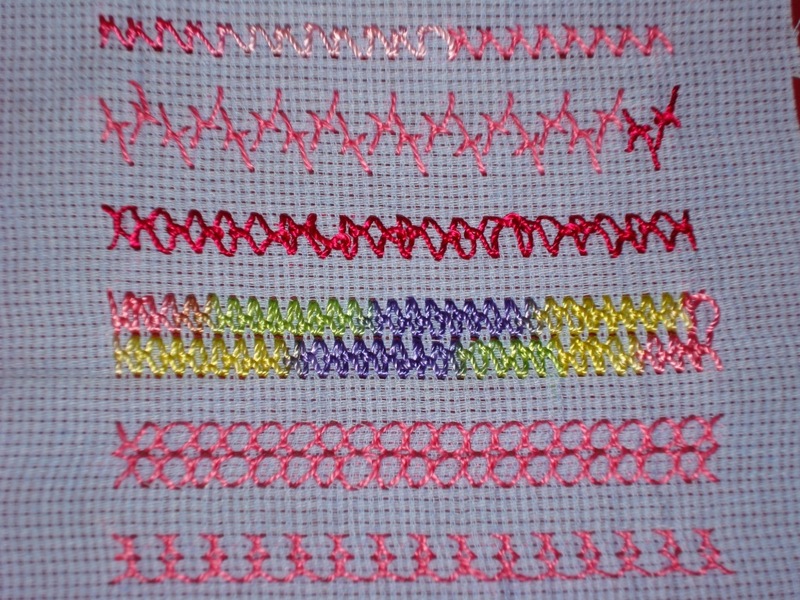 11c- this row is vertical version of this stitch, the twisting thread is worked with beads. Thus the siennese sampler is completed, I’ ll post the pictures of the full sampler in the next post. 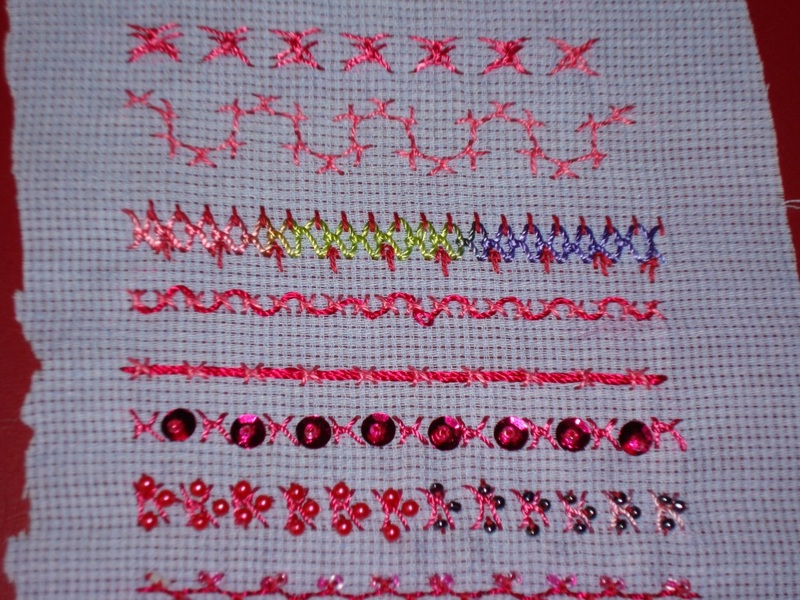 The variations of siennese stitch from the stitch challenge-TAST2010. 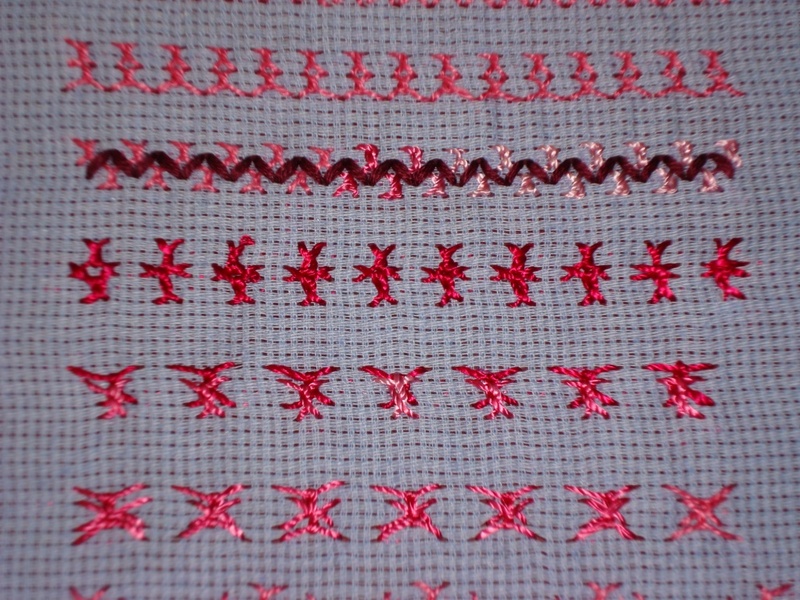 9a-The vertical version of siennese stitch, I tried placing one stitch on top of the other, and the top stitch is smaller than the bottom stitch here. 9b- Similar idea of 9a,but the stitches are of same size. 9c- Here the stitches are made in a curved line. 8a-A row of this stitch is done in inverted “v” shape,on top of each stitch a normal stitch is worked to give a decorative effect. 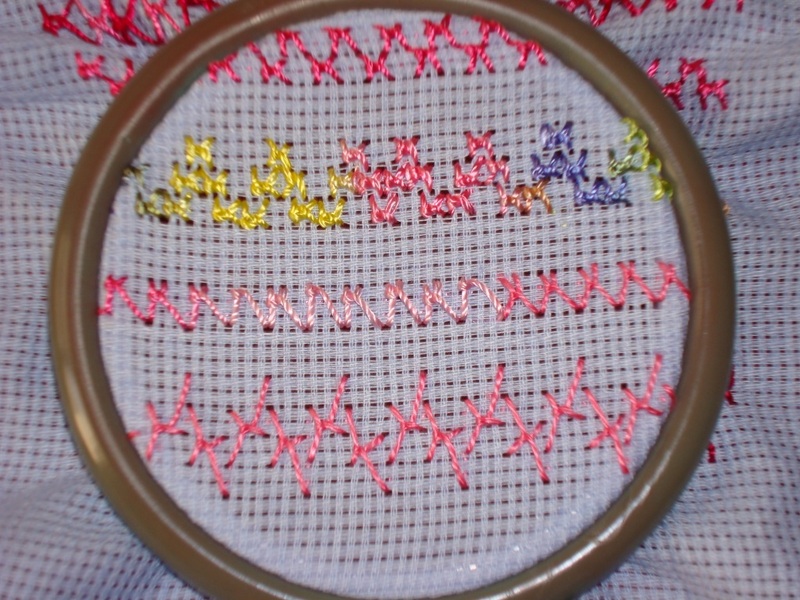 8b- A row of zigzag back stitch, the seinnese stitches are worked in the space in between. 8c- What was I thinking when I worked this row? definitely not having to write about it. 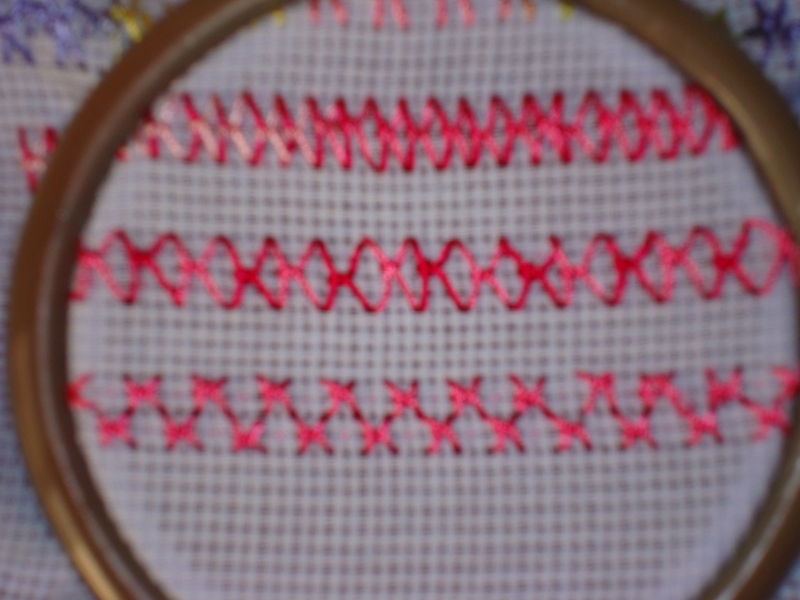 the top seinnese stitch is worked on the bottom running stitch and the bottom siennese stitch is worked on the top running stitch. There! I have written it. Just a few more of the variations of this stitch coming up. Some more variations of the seinnese st from the stitch challenge-TAST 2010 by Sharon. -In these rows , I have tried using this stitch as a filling stitch. 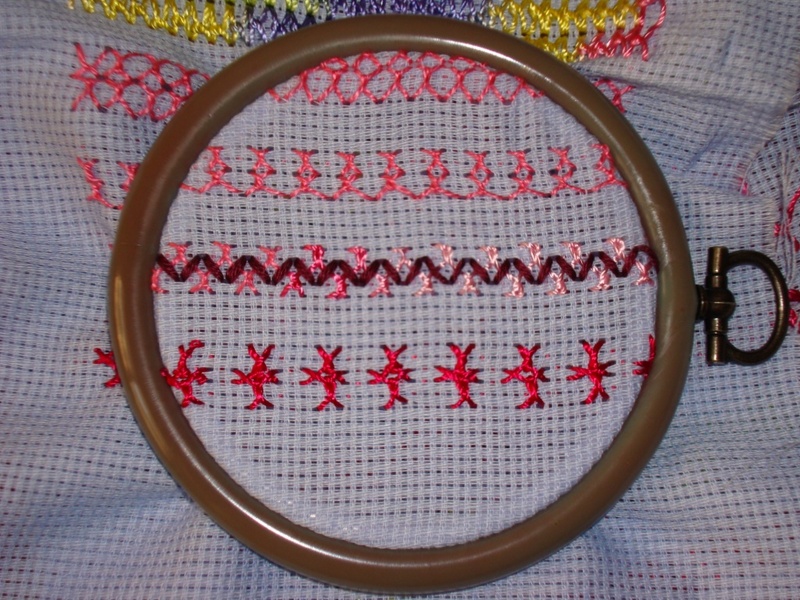 7a- The individual stitches are long ,and can be used for filling. 7b- two consecutive rows of siennese stitch filling, with variegated thread. 7c-Two rows of broad version of the stitch. Another set of variations in the next post. This is the sixth post of this siennese st of the stitch challenge –TAST2010 by Sharon. 6a-Again this stitch is replacing cross stitch and made into a pattern. 6b- here, the twisting thread is long armed. Will continue with the details. Another 3 variations of this 24th week stitch of the stitch challenge TAST 2010 by Sharon. 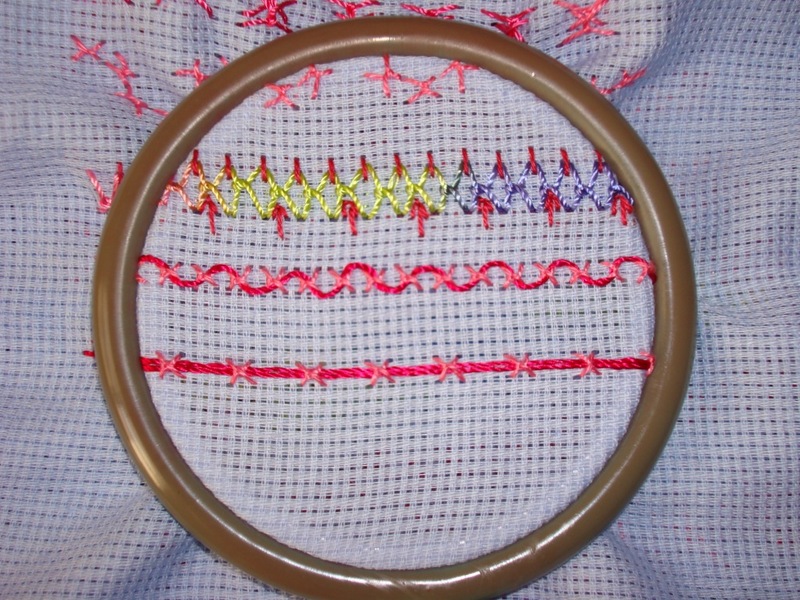 5a-the stitch is done with two threads, one for the straight stitch, a variegated thread for the twisting stitch. 5b- The checkered version of the stitch, with two threads, one plain, another variegated. 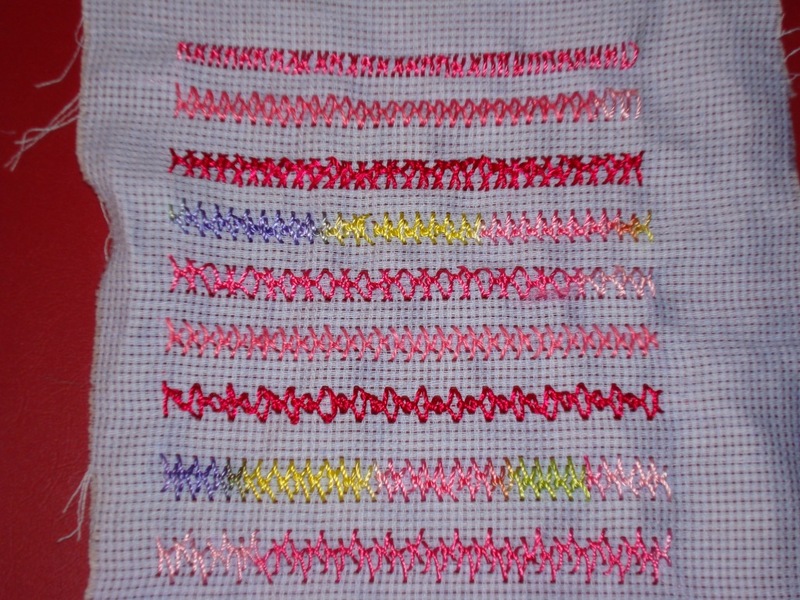 5c-I used this stitch as cross stitch and went up and down to create a pattern. The picture quality is not very good though, When I work the stitch with wrong tension it shows very clearly, but when I do it right, the picture is not clear.definitely not my day.these things happen. Few more variations in the next post.